Monetary rewards like % sale commissions or flat fee commissions are automatically tracked and calculated thanks to our Stripe, Recurly or Braintree integrations. To set up an affiliate style commission, select "Cash Reward" when you create a new reward on the Campaign setup. By default, the commission are set as recurring, this means that the affiliate will get the commission as long as the referred customer stays subscribed. 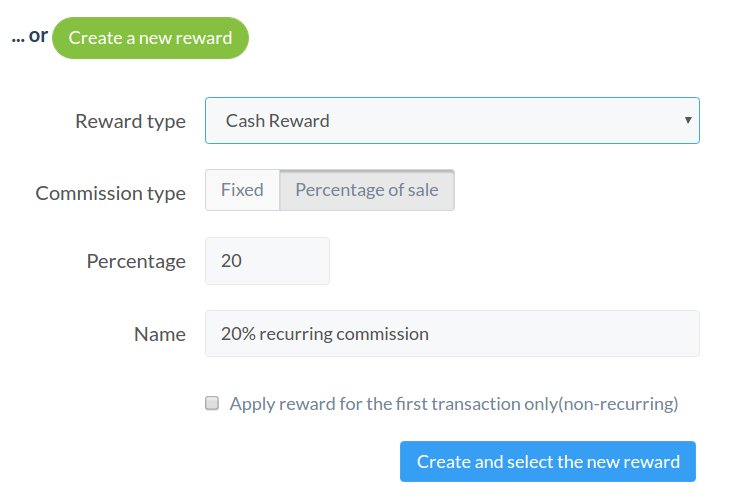 If you don't want to offer a recurring commission, check the "Apply reward for the first transaction only(non-recurring)" checkbox.